WordPress comes with a basic search feature which most sites outgrow. You can add a custom Google search in WordPress, but it comes with Google’s own branding. There are several other search options that you can add to your WordPress site. 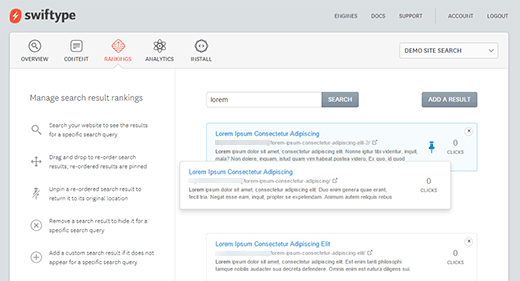 In this article, we will show you how to improve WordPress search capabilities with Swiftype Search. [Update 7/18/2016] Swiftype is no longer available for free. They currently offer a 14 day trial after which users will need to sign up for their paid plan. Swiftype is a search service provider specializing in site search and analytics. Anyone can sign up for their site search feature and install it on any website. Swiftype then indexes your documents and allows your users to search them. Swiftype Search is super fast and shows results instantly. It works out of the box which makes it ideal for beginners. Most importantly results are much more relevant than the default WordPress search. First thing you need to do is visit Swiftype website and sign up for an account . Once you signup, you need to get an API key. Login and choose a install method for your first search engine. You need to click on the WordPress plugin option. On the next page you will get your API key. Next, you need to install and activate the Swiftype Search plugin. 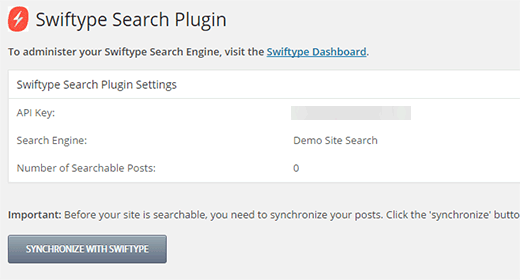 Upon activation, the plugin will add a new Swiftype Search menu in your WordPress admin. 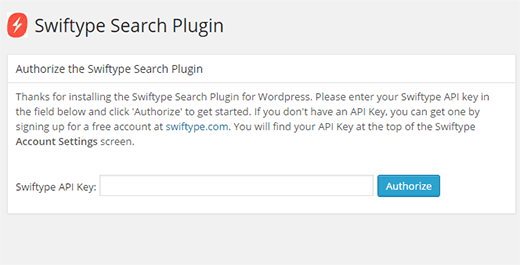 When you click on it, you will see the plugin’s settings page where you will be asked to enter your Swiftype API key. Enter your API key and click on the Authorize button to store your API key. 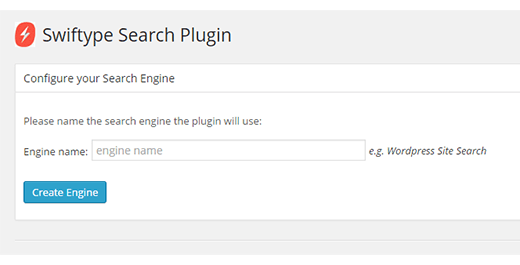 The plugin will now ask you to provide a name to your search engine. After creating your first search engine, you would need to synchronize your posts. This will allow Swiftype to crawl your content and index your posts for search. Click on Synchronize with Swiftype button to start the indexing. That’s all, you needed to do. Swiftype will automatically replace the default WordPress search on your site. If your theme does not have a search form, then you need to visit Appearance » Widgets and add Search widget to a sidebar. Swiftype search shows instant results as a user types keywords in the search form. You have full control on the search results, and you can even adjust them. Visit the Swiftype dashboard and click on Rankings tab, and search for the keyword you want to adjust. On the results page, you can simply select a page and adjust its ranking by dragging it up or down. 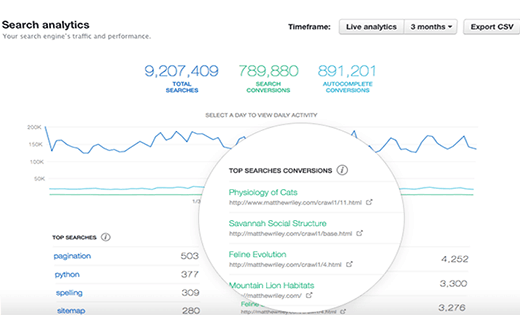 Swiftype also offers you insights into your website searches and conversions. You need to click on the Analytics tab on your account dashboard to view your search performance. These statistics help you see what your users are searching for, so you can improve your conversions and adjust your content strategy. If you have just installed Swiftype search on your WordPress, then you may not be able to see the analytics immediately. Give it some time to collect data and then come back. We hope this article helped you improve search feature on your WordPress site. You may also want to check out how to add a search form inside a WordPress post. Do you know how to add post thumbnails to the autosuggests in Swiftype form? Looks like my comment from a couple days ago disappeared. I’ve been using Swiftype for a while, and have been happy with results. Have you noticed any performance issues with Swiftype? I have now around 250 blog posts. Should I add Google Custom Search on my blog now? Which service are you using on WPBeginner? I have used Swiftype with Cloudflare. An excellent free tool for everyone.